I love all the benefits of crate training a dog or puppy! I see a crate as a tool to allow my puppy or dog future freedom. This post is sponsored by Carlson Pet Products, a company that makes pet crates, gates, dog beds and more. Remy is now almost 3 years old and we’re beginning to leave him loose when he’s home alone and at night. We’ve had zero issues with him as far chewing, barking, getting into the trash or counter surfing. Remy just relaxes on his dog bed when we’re not home. I believe this is directly related to the fact that for the first two years, we always left Remy in his kennel/crate when he was left alone. This was usually only for an hour or two because my husband and I both work from home. Our puppy learned to just chew on a Kong toy in his crate or nap quietly until we returned. This was a totally non-stressful, regular occurrence. Had we not used a crate during those puppy days, I believe my dog would’ve developed terribly bad habits such as chewing our stuff, barking, counter surfing or getting into the trash when left alone. I just wanted to show how using a crate can actually lead to MORE freedom in the future! I’m thinking about folding our crate up and storing it in the garage but I’m so thankful we have it! My young dog has gotten to do quite a bit of traveling in his 2.5 years! We’ve taken several LONG road trips to visit family. We’ve stayed in several hotels near national parks. He’s been to Air B&Bs. We moved across the country from San Diego to Montana, and I even left him at my parents’ house in Wisconsin for three weeks. For all of these “adventures” it’s been extremely helpful to have a crate from Carlson Pet Products. For example, when we went to Yosemite and stayed at a pet friendly lodge, I was happy we had our crate along so we could go out to dinner and relax knowing our puppy was not destroying our room. And when he stayed at my parents’ house, our pet sitters, they were able to put him in his crate at night knowing he wouldn’t chew anything or walk around waking everyone up. We’ve had a few friends and family stay with us, and I am glad my dog is kennel trained. He stays in his kennel at night so he’s not walking around waking everyone up. Over the holidays, we plan to have family stay with us for a week, and during that time it will be easier for everyone if Remy sleeps in his crate at night. Agility – Dogs are expected to wait in a crate when their handler steps out to learn the course. Vet stays – Most vets use a “crate like” kennel for patients that need to stay overnight or for a few hours during the day. Natural disasters – You never know when you may need to crate your dog due to circumstances or emergencies out of your control such as a hurricane. Flying – I do not recommend you fly with a dog that is too big to ride in the main cabin with you. However, sometimes life gives us limited options and your dog may need to ride in a crate in the cargo section. It’s totally fine if a dog owner chooses not to use a crate. I know plenty of people who have never used a crate and their dogs are just fine! On the other hand, it can’t hurt if your dog is at least accepting of going into a crate for short periods just in case of the life situations I mentioned above. If a crate is no big deal for your dog, then he’ll be less stressed out if he ever needs to stay in one for short periods. Think of it as part of training, by adding more experiences for your dog just as you might train him to ride in an elevator, climb on agility obstacles or have his nails clipped. 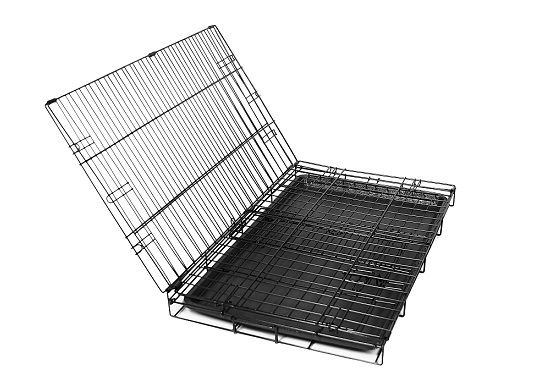 We have a fold-up wire crate from Carlson Pet Products. You can order a crate on the company’s website HERE. Cost: Our large crate (42” L x 28” W x 30” H) is $89.99 but prices range from $49.99 to $149.99. View all the sizing options here. 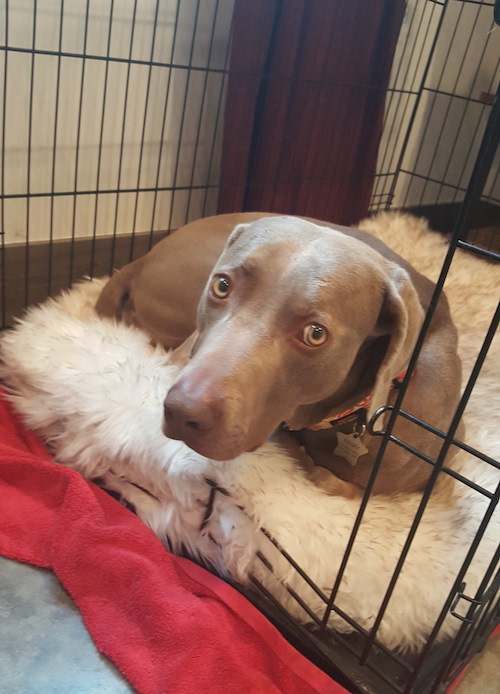 The large size is plenty big enough for my 60-pound weimaraner. It has one door at the front of the crate. Crates from Carlson Pet Products are collapsible, which is so nice for travel or storage. Our crate folds nearly flat and only takes about 20 seconds to fold up or set up, and I can do it myself. It’s built with a steel wire frame with a multi-point locking system that will keep your dog secure and safe in the crate. Do you use a kennel/crate for your dog? I so agree with you about kennel training any dog or puppy. Being able to handle herself in a crate is a nonnegotiable life skill at my house. As in if you can’t handle yourself in a crate, we are going to have a debate about whether you get to stay. It isn’t just the daily life aspect, although ALL of those things are important; keep in mind that any dog that I own will be a performance dog and not just a pet, so they will have to be able to handle being crates between runs. Being able to do the sport is a prerequisite for me having the dog, and being able to deal with a crate is just part of that. Yes, that makes sense. Was your girl easy to kennel train? Remy was. Surprisingly so, really. I adapted the “weekend crate training” guide (it’s on PetMD now I think) and spread it over the two weeks I was home with her and we didn’t have an issue. A puppy that young has a limited shelf life in the crate, but she didn’t fuss about being in there. She was easy. The crate was so helpful when my girl as a puppy when I had to leave the house . Now she just goes directly I. There and snuggles with her toys when I leave. It feels safe for her. My dog Ursa is kennel trained and I am so glad. It was actually the easiest part of my training him because I kept him in the kennel since he was young so he finds comfort in it and will even go lay down in his kennel without me needing to tell him. I also feel good about the kennel because I don’t have to worry about him while I’m gone and it keeps him calm to where he doesn’t bark. Sadly my kennel that I have has seen some better days. There’s places where the clips on the kennel have fallen off and some of the protection covers have bent out and become sharp. It’s a different brand from this one and I would like to give this brand a try. I really love the folding aspect so I can take it while traveling and moving around. The absolutely best advice we ever had regarding a dog was to use a crate. That was over 35 years and 4 dogs ago. It has helped with housebreaking, separation anxiety,travel,keeping our dog safe from undesirable toddler behavior, etc. With a puppy we have one in the bedroom and one in the family room adjacent to the kitchen (and one for the car if we want). We prefer wire crates for good airflow and visibility for the dog. 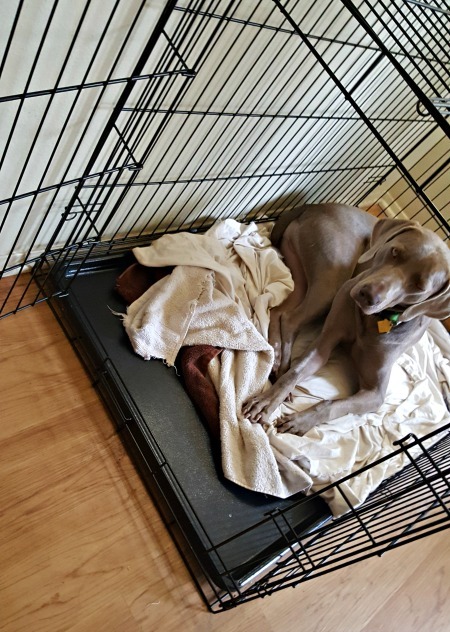 There are lots of great tips to get from other users to ensure your dog regards their crate as their dog bed- never as punishment. Yep, I feel the same way. It helped so much with everything you mentioned. Separation anxiety is a good one I didn’t include in the post. 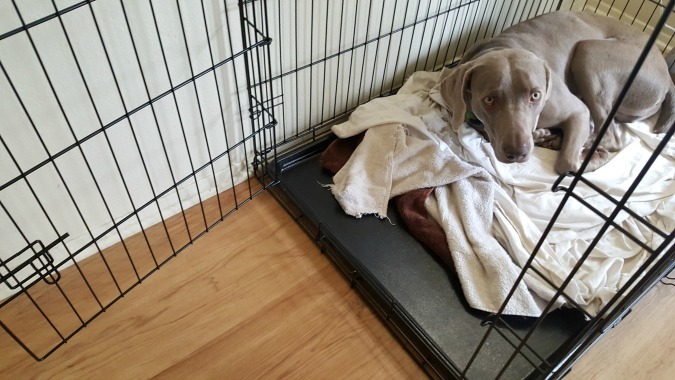 The crate helps a dog learn a routine when their person leaves and that it’s simply no big deal. All four of my girls love their crates! Their crates were essential for house-training and offer a special safe, secure spot for each of them to “get away from it all”! Let’s face it . . we all need our own space to let our hair down. 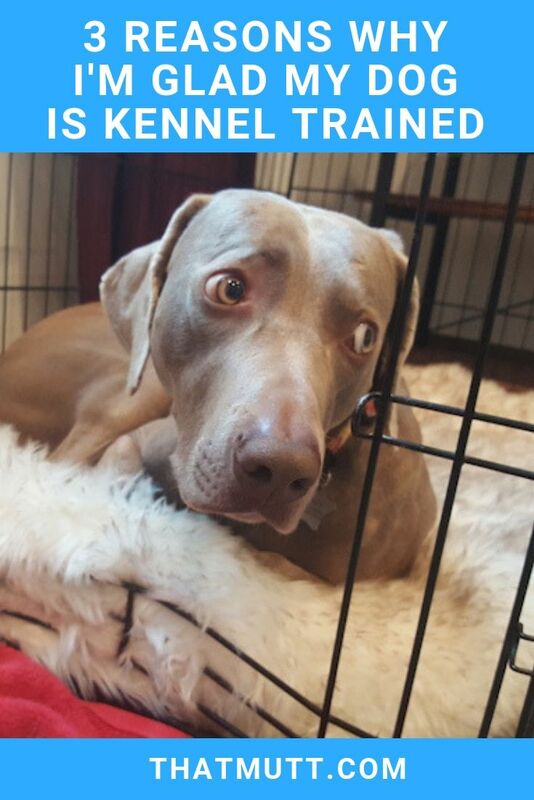 As a trainer, I always recommend that new dog families use a crate as way to offer the dog (puppy or older dog)a safe spot to call their own. 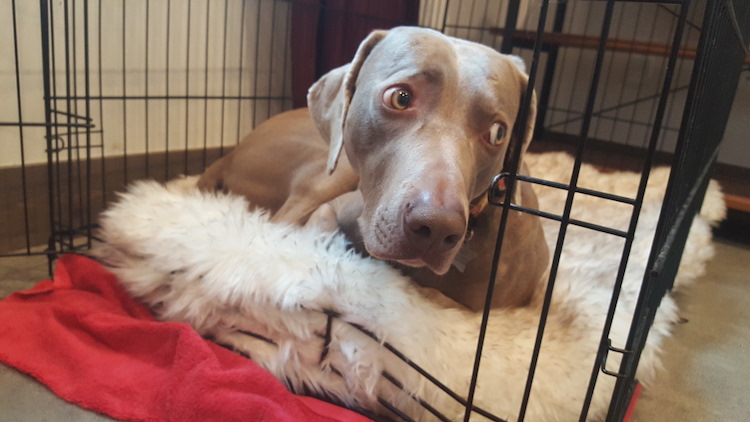 Dogs that have never used a crate sometimes take some time and training to acclimate to the crate — but eventually seek out the their crate as a safe haven. Got my first small dog, at 1 year he came to me not potty trained, and I was told by the breeder that he is untrainable. Trained in just a couple days! He can either get out of, shred, unzip, or hamster ball crates. I could use a small metal one for him. We compete in agility so I’d be useing it a lot! I’m all for crate training it’s one of the first things I do for fosters. My dog is crate trained. We crate him when we’re not home it’s been so helpful because he likes to get into things he shouldn’t. We don’t have a fold-up crate and I now realize that’s a huge error on my part. We are just a few blocks away from mandatory fire evacuations here in Southern California and there is no way we can fit us and our large plastic crate in a car to get out. We’d love to win a fold-up crate to pack with us in case if emergency, or even for a fun road trip! This is an aside but Sleepypod makes crash tested car harnesses. I’ve been really happy with ours. It might not help you now, but I can’t fit a crate in my car either, so my dog gets buckled in. Thanks for the tip! I should get a car harness, too. I was really thinking about needing the crate when we go somewhere else, like a friend’s home or hotel, etc. Oh! I’m an idiot. I see what you mean. The folding crate would be compact enough to transport. Yes. I have taken a trip in which I needed both a softsided crate AND a wire one for the week, and it was helpful that they both folded. My dog Taz is in his PetMate crate at night and sometimes when we have company. He loves attention and sharing my recliner with me. It would be nice to have one that could be folded when going places. I am currently crate training my new puppy. Crate training is so important, especially if your dogs do sports! My dogs would enjoy a new kennel. They love to travel and hopefully we will be showing soon. I have crate trained my Boxer/Rottweler since I got her at 8 weeks and she is now 19 months. She goes in the crate willingly and never cried or barks while in the kennel. I put a dog bed in for her comfort once but she tore that up so now I use a couple of towels and blankets and she makes her nest and is curled up sleeping when I come home. I have started leaving her out for short periods but it has been hit and miss. Sometimes she has been good other times she has counter surfed, so she is still crated when I go to work. Awesome post! Thank you for the info. My dog needs a crate because she will need to be crate trained before she can roam the house on her own, she also likes her own personal space. All good reasons!!! I have two crates that I’ve gotten second hand due to emergency reasons for kenneling our dogs. D.O.G. is going in for knee surgery next week and I’m getting out the kennel for traveling and our hotel stay over Thanksgiving. I would love to have another metal collapsible crate because we are eventually going to have another puppy and I want to start leaving them at home!! The only downside right now is that neither dog is used to being home alone and I want to start training for that! I hope D.O.G.’s knee gets better! I am going to be crate training my new English Mastiff pupppy, for his safety. Oh gosh, yes, crate training Missy & Buzz when they were tiny puppies was the best dog related decision I made. Just like with Remy, it meant that they could have the run of the house by the time they were 2 years old, without ever chewing on anything inappropriate. As they grew older, they still had their crates set up in the house at all times, and enjoyed lounging in there and/or busying themselves with a KONG or a frozen treat, but with the crate door open. Great idea taking a crate along to a Hotel room, or an Air B&B! I am about to get an 8 week old English Springer puppy. Lexi will be our 5th springer all were successfully crate trained. The crates were critical to our pups especially when we were working. Eventually, they were trustworthy and the crates were folded or shared. It has been 14years since the last puppy and we are retired and we are obsessed with successful training. Lexi is a trio bench springer nevertheless still full of energy. Bringing her home 2 weeks before the holidays and winter in Chicago, put us in uncharted house training waters. You’re very welcome! I am excited for you! When we first had our puppy we used a crate while we were gone to work etc. We eventually felt bad for him (first dog parent problems) and let him roam in the living room and kitchen. I believe it was too much freedom for our puppy because he chewed on multiple things (ruined our couch) he is now in his crate during the day and seems to enjoy it. I wish we would of kept up with it during the beggining. It is less stress on all of us! Yes we do have our dog crate trained. It would be nice to have one to fold up and travel. Not enough room to bring the regular sized one. 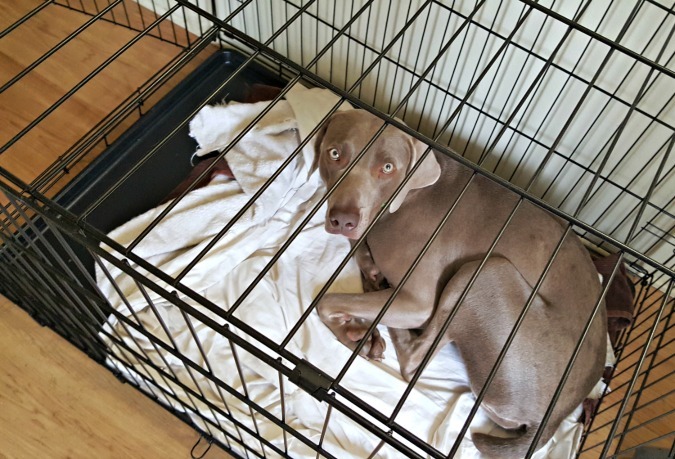 We have never used a crate for our dog, but the reasons you give are very convincing. Crate training is such a critical component to having a dog. Thanks for the article and the useful information. Agree with all your points! Our lab loves to relax in his crate. It also keeps him out of trouble when we leave the house. It’s the only place he can get himself completely on his back and stretched out at the same time. Totally agree!! Crates are amazing and a huge help. My dog has anxiety when I leave so it’s impossible to leave her out cause she will destroy the house. But she loves her crate but is outgrowing it fast! I love crate training! One of my dogs I had since a puppy and she was easily crate trained. I adopted a 4 year old dog and had a hard time crate training him since he had never been in a crate before! It took a lot of patience and I was determined to crate train him so he could ride in a crate in the car for safety reasons and also so he could come to agility competitions. I have a car crate for him but would love to have a collapsible crate for travel/ keep inside for him! 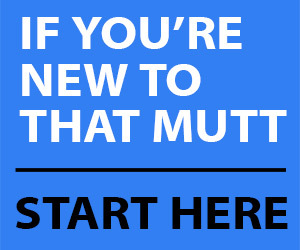 I completely agree with you completely about crate training! I crate bear and it helps him so much. He knows that his crate is his safe place the door is always open and when he’s overwhelmed, anxious, or scared he goes his crate and can calm down and be peaceful. He loves it! He is getting bigger though and hes starting to need a new crate. Crates are expensive and winning this would be a huge help!! !